Midge is a Quick Learner! 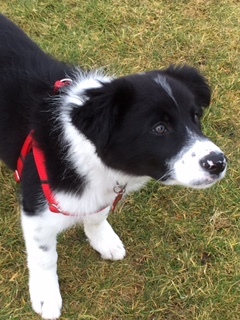 Tracey would love for you to say “Hello” to Midge, their 16 week old border Collie. Midge is an energetic young puppy that is always eager to learn. How did Midge become part of your family? 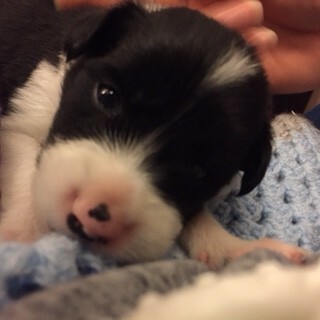 Midge was the last of a litter of seven and popped out at 180g. He started off quite poorly and needed a lot of love and attention in the early days. It was then that we decided to have him. We’ve never owned a dog before. It’s been a learning curve but we all love him so much. What is the one thin g that you love the most about having a border collie as a pet? Midge is so clever and quick to learn. He loves his weekly puppy training class (he excels at this!) He is completely trustworthy so is off the lead on his walks. Midge loves fetching and we have just introduced a whistle into his training. Midge spends our working day with his mum Rosie, brother Rhuridh and his Auntie Pippa. He has learned great dog skills from the older dogs. day is a fun filled day with Midge around.